From painting supplies and home essentials to plumbing and building materials, Van’s hardware store has it all. What’s even better is you could win a $500 shopping giveaway when you visit our family owned Dyckesville location! The Do it Best® $500 Shopping Giveaway runs from February 19th until our Customer Appreciation Event on Wednesday May 23rd, where TWO lucky winners will be selected at random. (No purchase necessary. You do not need to be present to win.) Our annual Customer Appreciation Event begins at 11:00am, is open to the public and features FREE lunch plus a variety of specials, product demos and more. 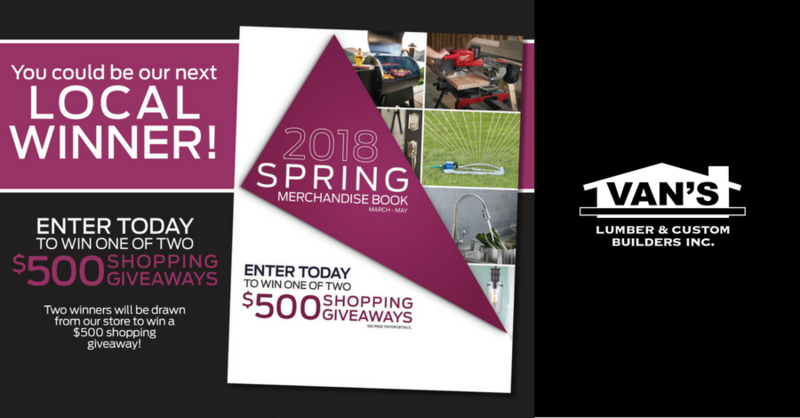 Stop by our hardware store and lumberyard today for all your home improvement needs, and to enter for a chance to win a $500 shopping giveaway!